Heidelberg Engineering is showcasing the OCT Angiography (OCTA) Module for its SPECTRALIS® diagnostic imaging platform at the American Academy of Ophthalmology Annual Meeting in Chicago. The OCT Angiography Module non-invasively produces detailed three-dimensional representations of the perfused retinal and choroidal vasculatures. Heidelberg, Germany – The SPECTRALIS® expandable diagnostic imaging platform can be upgraded with the OCT Angiography Module to perform non-invasive, layer-by-layer examinations of flow in the vascular networks of the retina and choroid. 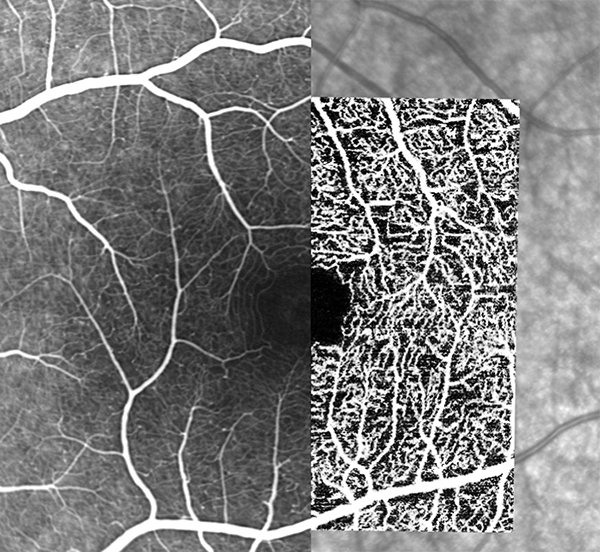 Combined with structural OCT and fluorescence angiography, the OCT Angiography Module enables a more comprehensive understanding of vascular abnormalities. The OCT Angiography Module can be added to new and existing upgradeable SPECTRALIS devices with the OCT2 Module. The multimodal imaging platform allows clinicians to compare OCT angiographies to other modalities such as structural OCT and dye-based angiographies as well as infrared, MultiColor and BluePeak images, dependent on the SPECTRALIS model. SPECTRALIS offers high resolution OCT angiography with a lateral 6 microns per pixel for visualization of capillaries. An axial resolution of 3.9 microns per pixel enables precise multilayer segmentation. All four vascular plexuses of the retina as described by Tan et al.1 (located in the nerve fiber layer, in the ganglion cell layer, at the border of the inner plexiform layer and inner nuclear layer, and at the border of the inner nuclear layer and outer plexiform layer) can be investigated. Like all SPECTRALIS diagnostic imaging modalities, the OCT Angiography Module benefits from the precision of TruTrack Active Eye Tracking which avoids motion artifacts and ensures high resolution images. The SPECTRALIS platform offers a unique combination of non-invasive OCT angiography with dye-based, gold-standard fluorescein (FA) or indocyanine green (ICGA) scanning laser angiography. With this hybrid angiography approach, OCTA images can be directly correlated pixel to pixel to FA or ICGA, setting a baseline for subsequent OCTA-only follow-up examinations. The Scan Planning Tool automates OCTA scan placement on a region of interest identified on FA/ICGA or any other previously-acquired cSLO image. Such reference images can originate from the same or another SPECTRALIS device. With the convergence of established and emerging imaging techniques, the SPECTRALIS platform supports the understanding and adoption of new diagnostic tools such as OCTA in routine clinical practice. “There is a great deal of interest in OCTA and at the same time uncertainty due to its technical limitations and interpretation challenges. We see multimodal imaging as a good approach to deal with those issues. For instance, OCTA is a valuable imaging modality to follow up on an existing FA, and our SPECTRALIS platform offers the possibility to do exactly that,” said Dr. Kester Nahen, Managing Director of Heidelberg Engineering. The OCTA module of the SPECTRALIS uses a complex mathematical model fed by full spectrum OCT data. The full spectrum approach enables three-dimensional OCTA imaging with high axial resolution separating thin vascular plexuses. The mathematical model is highly sensitive and allows the visualization of small changes between consecutive OCT scans representative of vascular flow. This method results in high contrast between areas of vascular flow and surrounding tissue. The SPECTRALIS is an ophthalmic imaging platform with an upgradable, modular design. This platform allows clinicians to configure each SPECTRALIS to the specific diagnostic workflow in the practice or clinic. Options include: OCT, multiple scanning laser fundus imaging modalities, widefield and ultra-widefield modules, scanning laser angiography and OCT angiography. The OCT Angiography Module is not for sale in the United States. Heidelberg Engineering will deliver the OCTA Module to customers outside the U.S. in November 2016.